BSM ditches Corsas for Fiat 500s | What Car? Driving school BSM has ditched the Vauxhall Corsa in favour of the Fiat 500. BSM has signed a deal with Fiat to receive 14,000 cars over the next four years most of which will be the 500 supermini as well as Grande Puntos. After 17 years of using Vauxhall's Corsa, BSM's managing director, Abu Shafi, says he's making the switch to Fiat because he feels 'the partnership of BSM and the Fiat 500 has a great synergy'. The 500 is also an ideal learner car, according to BSM, because of its manoeuvrability, safety features, low emissions and fuel economy and visibility. The first 500s will arrive towards the end of September and the company says it should have a full fleet of Fiats in place at its 94 UK driving centres by the end of the year. 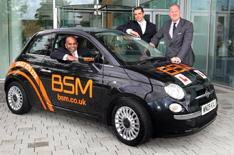 The deal with BMS also ensures that Fiat heightens its profile with young drivers BSM says it teaches more than 130,000 new drivers each year. To help turn learner drivers into Fiat owners, the manufacturer will give a 500 discount, over and above any dealership discounts, to new drivers who have taken lessons and passed their test in a BSM Fiat 500. While Fiat's plans to offer a discount on the 500 to BSM pupils will be popular with buyers, existing owners could see hundreds wiped from the value of their car.